If you decide to go ahead with the purchase, please let us know the specifics when you are done. I love a good success story! Already taken the first step of contacting an agent online over the weekend. Am quite surprised actually that I have not received a response by now, the end of first business day. the average high temperature for Dartmouth, Nova Scotia is in the 60's for June, July & September, and a balmy 71 in August. Realistically I will use the place maybe 1 month at most out of the year. I'm west coast based. June to Sept temperatures look quite pleasant, and having lived in New York City I am OK with the fall too. I bet the foliage around October in Nova Scotia is spectacular, well worth staying to see one of the years. If there is a seaport anywhere near, you will be able to hire someone to deliver supplies and run you back and forth. How calm is the ocean? My Son has a 23 foot aluminum fishing boat that is suitable to go 60 miles out into the Pacific after halibut on days when the ocean is in a good mood. If there are not a lot of big storms, you could get a boat like that and leave it in a secure boat storage yard in the area. You keep insurance on a boat like that. My son paid about $60,000 for his, but a less fancy similar new boat can be had for about $30,000. They don't go down much as they are used, so might as well buy new and get brand new motors. It's my understanding that those aluminum fishing boats are a west coast thing and not available anywhere else but on the west coast, but it is a trailerable boat, so easy to get one moved. There are no "seaports", from satellite image I see sparsely populated houses only along the coast. The ocean water looks very very very calm. That's one of the weirdest things. In all pictures of all islands for sale, the water is very calm; I see waves no higher than 1/2'. The ocean is like a lake! Could this be the local ocean condition? Here on west coast we have those blessed days but often the waves can be 3-6' high. Flat water is great if under the water is teeming with fish life. But the pictures reminds me of lakes. 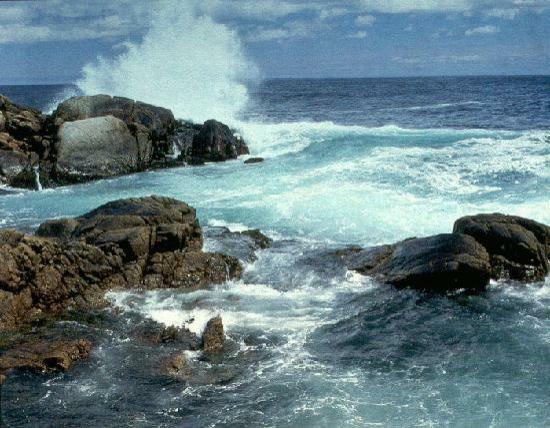 The Canadian Atlantic area has some of the highest tides in the hemisphere. Please don't assume a picture in a 'For Sale' ad is representative of actual oceanic activity. Yeah! This is the type of vibrant ocean I like!! Flat ocean is too boring. I haven't read the whole thread, so forgive me if this has been mentioned. Have you looked at the Thousand Island region up by NE Canada (I think that's where it is)? https://visit1000islands.com/ People own a ton of islands in that area. I've also seen islands for sale in the middle of rivers and lakes. There's lots of people in Europe who live on canals and islands and it's perfectly normal. One of the first customer I helped when I went to work for Kinko's was someone who wanted to make copies of her island. It was just a little larger than the house and had a long floating bridge to the mainland. How cool is that? And something else - if you don't get an island, maybe you can have a float house. That's a house that's anchored in the water, usually a lake, and stays there permanently. If you have the money for it, and that's what you want to do, go for it. I've always wanted and island myself. Look at the bright side - you won't have to spring for fencing for the dogs. Just talked to the agent. Can you believe, he owns the island adjacent to the one I am interested in!! We are gonna be neighbors. The ball is rolling now. Looks like another sight-seen purchase. Ha. Good luck OP. I just hope we don't see a "how do I sell an island" post in a couple months. Have you sorted out how you will get to the island?